Today brings a new message from your friends at Monarch Sciences, a totally legit operation that’s completely on the up-and-up. No way they’re irresponsibly experimenting with genetic mutation and irradiation, no siree, they’re just another innocent chemical processing corporation trying to make an honest buck in a shrinking workplace. (The chemical processing industry has gotten rough ever since the recession, and mom-and-pop conglomerates are taking the hit especially hard.) The truth, as anyone who saw the Godzilla remake from 2014 already knows, is that Monarch Sciences was responsible for the creation of the thunder lizard, and now they’re back up to their usual business. The image above depicts the one and only Mothra, a recurring foe of Godzilla and the star of the upcoming sequel Godzilla: King of the Monsters. 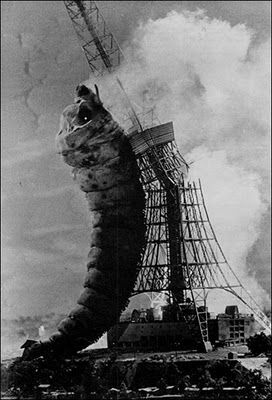 As the name might suggest, Mothra is a gigantic moth-like freak of nature, and in the image above, she’s flanked by two of her larvae, just as capable of toppling the Tokyo Tower as the all-grown-up-iteration. Above them, we see a large, significant egg — what is it hiding? We’ll find out in 2019, when the film comes to theaters. Markedly absent from the image above? The tiny telepathic twins that can summon and control Mothra, as first introduced in her eponymous 1961 film. Their siren song could be easily slowed-down, transposed to a minor key, and intercut with various BWAAAAAAAMs for a future trailer — just a suggestion, Legendary!